At least 15 people were killed and 100 were injured when gunmen attacked a mass service at the Our Lady Fatima Church in Bangui on 1 May. A Catholic Priest was among those killed in the attack. Hundreds had gathered for the service at the Our Lady Fatima Church when armed men reportedly from the KM5 district threw grenades and fired on the church. The Chancellor of the Archdiocese of Bangui has identified Father Albert Toungoumale Baba as the priest killed at the church. Several of those killed or injured were trapped in the church compound as the gunmen attacked and were unable to flee until police intervened. The President’s wife is reported to have been in the church, but was evacuated shortly after the attack began. Local sources report that constant gunfire was heard in and around KM5 district from the time of the attack until 3pm. After attacking the church, the perpetrators moved into neighbouring districts looting shops and homes and attacking civilians. An Evangelical church member was killed outside of his home. Reprisal soon followed with a local Mosque being vandalised, and cars and personal property looted and burned. The situation was calmed by the United Nations (UN) Peacekeeping Mission in the Central African Republic (MINUSCA) and local security forces who have initiated joint patrols of the capital to prevent further violence and repel demonstrators. 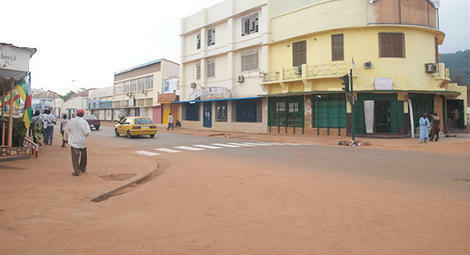 The attack was reportedly perpetrated by armed elements from the KM5 district of Bangui, which is predominantly a Muslim neighbourhood. Armed groups remain in the district and are responsible for periodic attacks on civilians. Attempts to disarm the groups, which operate as criminal gangs, have often failed. Last month 21 people were killed in the KM5 district after MINUSCA and local security forces attempted to disarm armed groups in the area, resulting in fighting by both sides. The day after the deaths, protests were organised by residents of the district calling for protection of civilians by the security forces and MINUSCA. Since November 2016 the conflict in the Central African Republic (CAR) has taken on a more prominent ethnic dimension. However, religiously-motivated attacks continue to occur. On 7 February three churches were burnt and a pastor was killed in the KM5 district of Bangui following the death of a gang leader at the hands of MINUSCA and the police. On 11 February 2017 Front Populaire pour la Renaissance de la Centrafique (FPRC) leader, General Zoundeko, was killed near Bambari and several churches in the Ouham area were subsequently set on fire in reprisal attacks. Our Lady Fatima Church was previously attacked in 2014 by gunmen who killed a priest and several churchgoers. 1. CAR’s civil conflict assumed a religious dimension in March 2013 when Seleka, a predominantly Muslim rebel coalition, took power in a coup, suspending the constitution, dissolving the government and National Assembly, and eventually installing one of its leaders, Michael Djotodia, as president. In September 2013, Djotodia officially disbanded Seleka; however, many rebels refused to disarm and sectarian violence increased. 2. Sustained and severe human rights violations during the civil conflict eventually resulted in retributive violence following the emergence of anti-Seleka groups commonly referred to as ‘anti–Balaka’. Although the anti-Balaka groups have been widely described as “Christian militia”, they are in reality composed of pre-existing village defence groups bolstered by former soldiers loyal to deposed President Bozize, former Seleka fighters, angry youths seeking revenge for Seleka violations, and common criminals.